Do you want to feel real extreme without even making any extra movements but just sitting on your favorite sofa before a fire place? A wonderful game for the Christmas and New Year holidays offers you such sensations. It’s so exciting and breath taking that involves you completely into the Santa’s Rollercoaster 24 realistic tracks located in the North Pole. You can get a 5 star rating for each Christmas filled track and thus multiply your score. The great deal is that you can tap or touch the screen to accelerate and brake or use the accelerometer feature by tilting the device to make the carts go faster and slower. So awake your adrenaline and feel real extreme with just a little device in your hands. 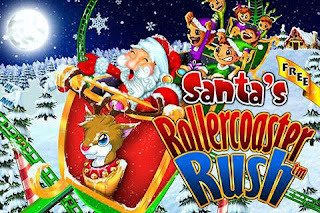 Santa’s Rollercoaster Rush is a Digital Chocolate’s Christmas gift for all owners of iPhone and iPod touch for FREE at the iTunes App Store.